Thomas William “Tom” Roberts was an Englishman who was born in Dorchester, England on March 9, 1856. His family migrated to Australia when he was 13 and settled in Collingwood, a Melbourne suburb. Roberts was a distinguished Australian artist. He was also a pivotal member of the Heidelberg School, a late 19th century Australian art movement, now classified as Australian Impressionism. Roberts used to be a photographer’s assistant while he was taking art lessons at the Collingwood and Carlton Schools of Design from Louis Buvelot, a Swiss master artist until the 1870s, while he was still in his early teens. He continued his studies at the National Gallery School in Melbourne in 1874. He became friends with many artists during this time, including Frederick McCubbin. From 1881 to 1884, he was enrolled at the Royal Academy Schools in England as a full time art student. He was the first major painter in Australia to receive a scholarship, which the Victorian Academy of Arts sponsored in part. Roberts defrayed his other expenses by being an illustrator for the Graphic in London. Tom Roberts was a prominent member of the Heidelberg School and was also famous as the Australian pioneer of Indigenous landscape painting. He learned the techniques of Impressionism, which was starting in Europe when he was an art student there. In 1885, when he returned to Australia, Roberts introduced Impressionism’s style of en plein air painting and used to go out to Heidelberg and Box Hill in Melbourne. Aside from being a pioneering Impressionist landscape painter, Roberts was also excellent in portrait art, with “The Big Picture” as one of his masterpieces. Late in the 1880s, he strongly supported the development of an Australian style of painting that would be based on the unique themes in Australia. Over the following years, he painted many major canvases in the genre, with “Shearing the Rams” that he painted in 1890 and which now hangs in the National Gallery of Victoria as one of his famous works. 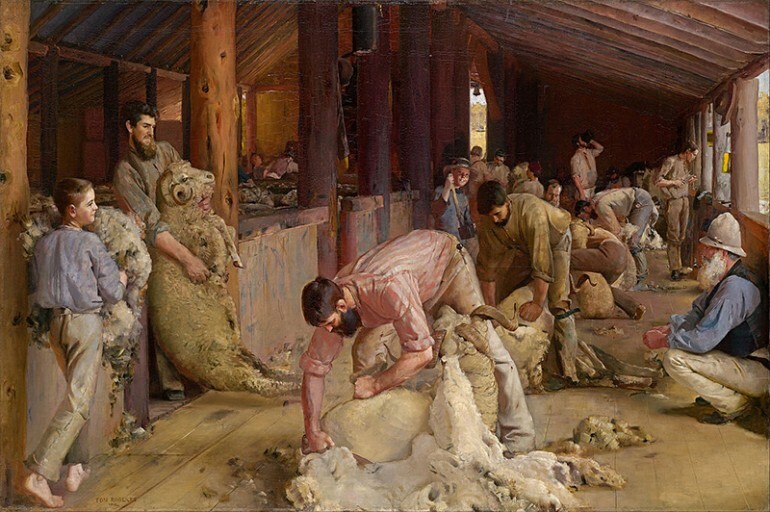 This particular painting took three years to complete, with Roberts visiting the sheep station in Brocklesby, New South Wales several times to paint the process of sheep shearing. He did about 80 oil sketches of the process on the spot, capturing the men at work, the sheep, the atmosphere and the pervading light in the shearing shed. In 1890, he finally completed the painting on location. It became the iconic image of the national identity that was just emerging at the time, since Australia was known for its wool industry. 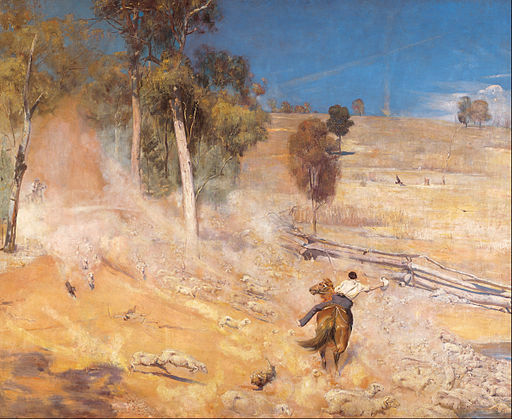 Other paintings in the same theme include “Shearing at Newstead: The Golden Fleece” that was painted in 1894 and “Bailed Up” that he did in 1895, which depicted a stage coach held up by bushrangers in a remote spot in Inverell, New South Wales. Several regional artist groups influenced Roberts while he was studying in London. He discovered techniques from the Newlyn School, the Aestheticism of Whistler and the naturalist styles of artists such as Jules Bastien-Lepage and the followers of the French artist. While still studying in London, he went to Spain in 1883 and met Ramon Casas, a Catalan modernist artist. He learned the basic techniques of Impressionist painting from this man. In 1884 he went to Venice and did several rapid sketches of a Venetian lagoon en plein air, in the style of the Impressionists. In 1885, upon his return to Australia, Roberts established a school of plein air painting, joined by several artist friends, including Fred McCubbin, Charles Conder and Arthur Streeton. Roberts did many portraits of artistic, literary and political figures, including portraits of Alfred Hill, Major General Hutton, G.W. Marshall-Hall and Sir Henry Parkes. He became interested in doing Aboriginal portraits and made several trips to the islands in Torres Strait and in Queensland beginning in 1892. His Aboriginal portraits depicted his sitters as individuals rather than tribe members. Thomas William Roberts was also highly skilled as a frame maker, from which he gained income when he did not have painting commissions. His wife, Elizabeth (Lillie) Williamson died in 1928. He remarried that same year and died three years later on September 14, 1931.